All information relevant to the 6th running of the Black Squirrel Half Marathon is available on the race website. Here are a few final details and reminders. The current weather forecast is showing a race-day high in the mid 80s. Please make sure you have adequate carrying capacity for your hydration needs between aid stations. Water cups will not be provided at the aid stations. The three race aid stations will be stocked with water and V-Fuel sports drink. The Arthur’s aid station – visited twice – will also carry snacks and fruit. 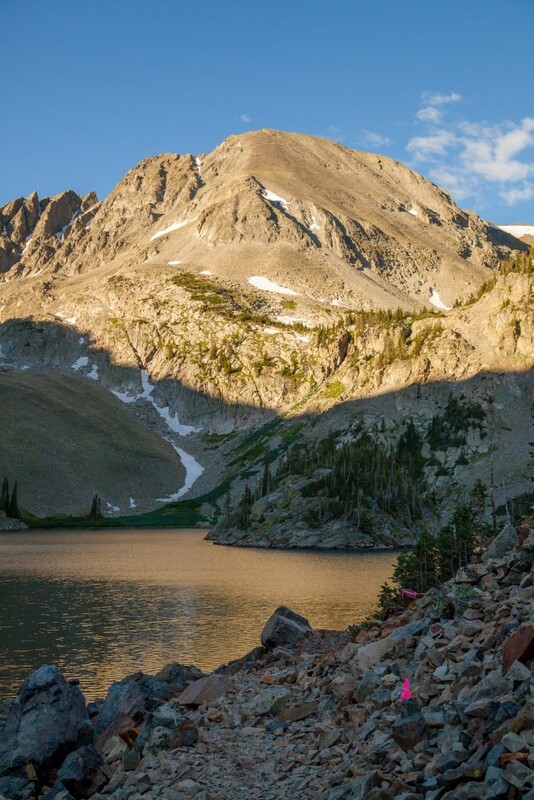 Packet pickup will be available on Friday afternoon from 4pm to 7pm at Altitude Running located at 150 E Harmony Rd., Fort Collins, CO 80525 (northeast corner of College and Harmony). 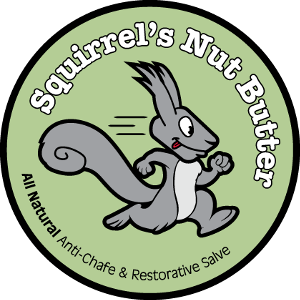 We will be distributing bib numbers, race T-shirts, Squirrels Nut Butter samples, Justin Liddle DMD toothbrushes, and will have additional Gnar Runners and Black Squirrel merchandise for sale. Packet pickup will also be available on race morning from 5:15am to 6:30am. The race will start promptly at 7:00am. There will be a short pre-race briefing at 6:50am. 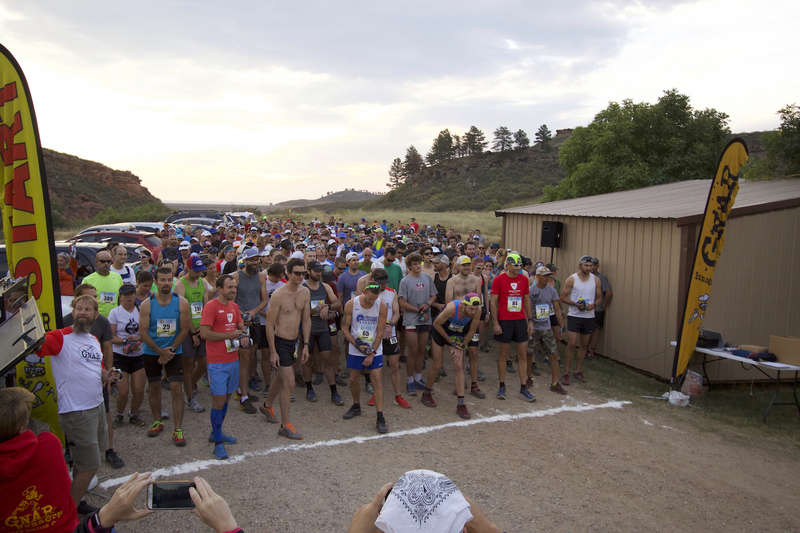 Late arrivals will need to walk up to a mile to the start from the overflow parking at the Eltuck Picnic area, so we recommend getting to Lory State Park no later than 6:00am if you need to check in on race morning. Parking at the Soldier Canyon start/finish area (limited to 50-60 cars) is reserved for carpools of two or more runners. All other cars will be directed to park on the Lodgepole loop road or at the Timber trailhead lot. 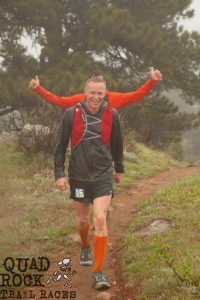 If you can, please arrange a carpool with friends – or try the Fort Collins Trail Runner Facebook page. Parking passes will be handed out at the park entrance when you arrive. Bibs must be visible from the front. Please do not remove your pull tag. Dogs are welcome on leash with family and friends at the start/finish area, but we ask that you not run with your dog during the race. 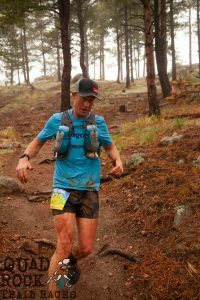 Please pocket any trash and dispose of it at aid stations or at the start/finish. Trails are open to the public. Watch for bikers and yield to horses and hikers. We will have a free 1 mile kids race/run beginning at 10:30 from the start/finish area. After your finish, stick around for our post race party and Great Harvest pancake breakfast. 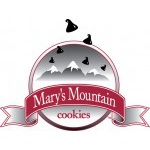 In addition to fruit, soft drinks and other trimmings, we’ll have cookies from Mary’s Mountain Cookies and Fat Tire beer (3.2) from New Belgium Brewing. Additional post-race food and beer for family and friends can be purchased for a $10 cash donation to our post-race beneficiary, the CSU Food & Nutrition Club, if not already purchased with registration. 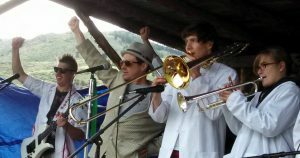 For post-run entertainment, the Swashbuckling Doctors will be serving up their unique brand of Fort Collins Ska. 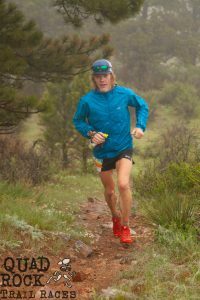 Salomon Running will be demoing shoes for runners to try out after the race, and we’ll be giving away Salomon packs to our top male and female finishers. All finishers will receive a commemorative pint glass. And we’ll be giving out unique overall and age group awards to the top three finishers (male and female) in the following categories: overall, under 30, 30-39, 40-49, 50-59 and 60+. We’ll also have sponsor gear and goodies to raffle off during and after the awards. Massage and PT work will be available after the race courtesy of Colorado in Motion, Diane Bergstedt and Kristel Liddle. 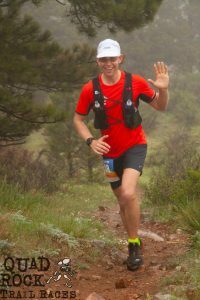 Thank you to our very generous top sponsors: Salomon Running, Colorado in Motion, Justin Liddle DMD, Drymax Socks, Altitude Running, Countryside Animal Hospital, JAX Mercantile, and the Fort Collins Running Club for their support in helping make this event possible. Thank you also to all our wonderful product supporters. Please consider supporting these businesses who support the race. If you have questions that are not answered here or on the website, then please email us at racedirector@gnarrunners.com. We will do our level best to respond in a timely manner. We look forward to seeing you all on Saturday morning! 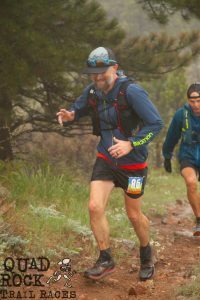 May is an unpredictable month here in Northern Colorado, and once again the weather played a role at the 2018 Quad Rock 25 & 50 Mile Trail Races. After enjoying (and suffering through) toasty conditions in 2017, this year we were served up a wet, cool day which left the trails uncharacteristically muddy (see below for a note on trail work). 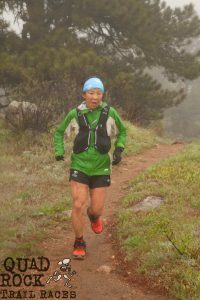 Nonetheless, the day produced a commanding new course record in the men’s 25 mile race and fast winning times in both the 50 mile races and also the women’s 25 mile race. In addition, we saw record finisher numbers in the 50 miler and a whole host of wonderful finishes across our full field of runners. Overall, we saw 196 runners start the 50 mile race and 223 start the 25 mile race for a total of 419 runners on course. 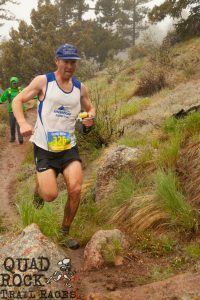 Of the 196 runners that started the 50 mile race, a record 142 completed the full two loops for a 72 percent finisher rate. 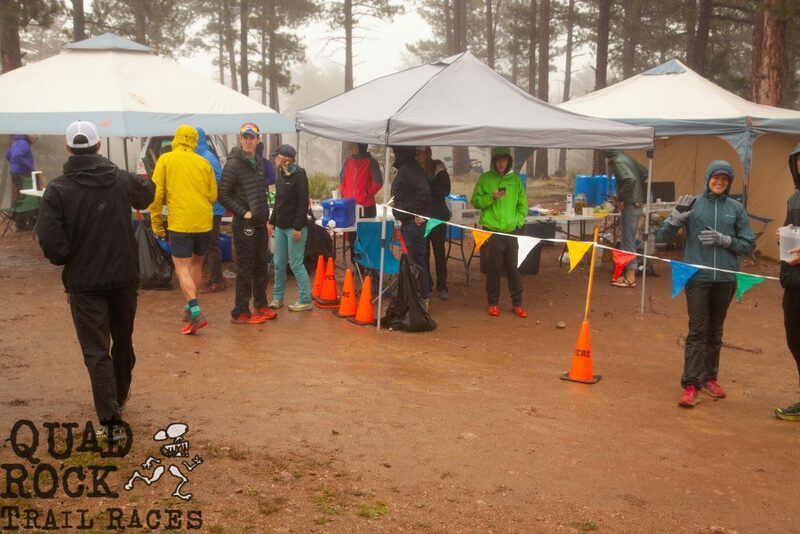 A total of 267 runners finished the 25 mile race or the first 25 mile loop of the 50 miler (all are included in the final 25 mile results). 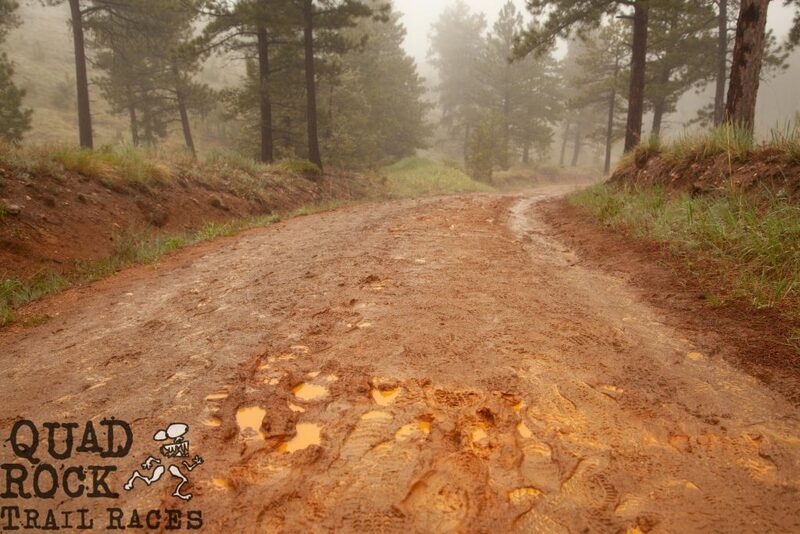 The race this year was held on unusually muddy trails. Sections of some of the lower trails saw some trail damage as a result. We are currently in discussions with managers at both Lory State Park and Horsetooth Mountain Park to arrange a trail work day, which we hope to make an annual ‘Trail Runner Trail Work Day’. We will make announcements as we have them on dates and times. In the men’s 25 mile race, Jackson Brill – just 19 years of age – took control of the race in the early going and was able to maintain a two- to three-minute lead over Chris Mocko for the full loop, coming home in a new course record of 3:13:06. Mocko would also dip under Mike Aish’s 2016 course record on his way to finishing second (3:15:56). On a quick day all around, Quincy O’Connor rounded out the podium in a time that ranked eighth all time (3:26:52). In the women’s 25 mile race former champion, Ginna Ellis, led it out from the gun and came very close to holding her lead all the way to the finish. 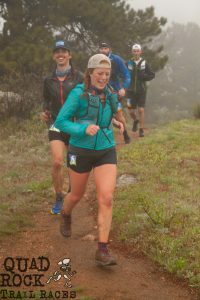 However, Abigail Levene was just too good on the final Timber descent, passing Ginna with a couple of miles to go and beating her to the finish by less than a minute. Abigail’s 4:05:01 finish time ranks second all time (closely followed by Ginna’s winning time from 2016). Castle Rock’s Corrine Shalvoy rounded out the podium in a time of 4:17:35. Abigail Levene on her way to winning the 25 mile race. Masters (40-49) wins in the 25 mile race went to Longmont’s Tim Fahy (4:24:25) and Boulder’s Kelly McConnell (4:54:09). Our grandmaster’s (50+) winners were Blaise Brochard (4:36:35) from New York and Marianne Osteen (5:33:49) from Steamboat Springs. sport. 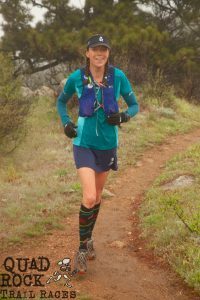 Michele Yates was named Ultrarunner of the Year in 2013 by Ultrarunning Magazine, while Addie Bracy has made her name in the trail running world over shorter distances, twice having won the US Mountain Running Championships and last year being named US Mountain Runner of the Year. 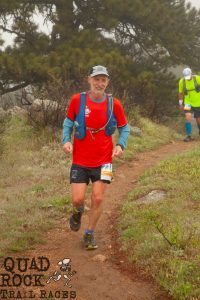 It was the more seasoned ultrarunner, Yates, who took control of things on the opening 25 mile lap, before being caught and passed on the way out from the 25 mile turnaround. Bracey would go on to build and consolidate a lead during the second lap, ultimately finishing in 8:51:18, 13 minutes ahead of Yates in second. 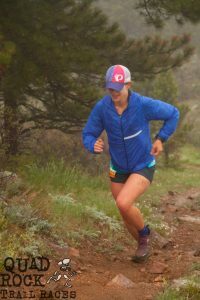 For Bracey it was just her second 50-mile finish as she gets ready for the Leadville 100 in August. 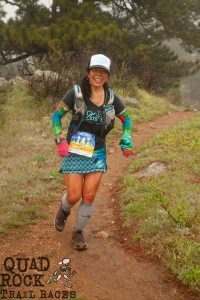 Esther Erbe came home in third (10:22:54) in what was – impressively – a first ever ultramarathon finish for the Texas resident. who would take top honors. 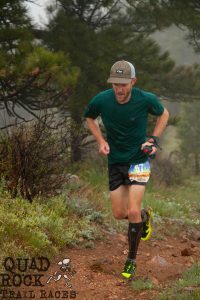 In his first 50 miler, Elam ran like a seasoned veteran tracking early leaders Bobby Peavey, Aaron Robson, Gavin Coombs, Oliver Knauer and Frank Pipp around the opening 25 mile loop before opening up a gap on the second loop and holding onto it in commanding fashion. Elam registered the third fastest finish ever (7:40:25) on his way to besting Frank Pipp (8:07:41) and Oliver Knauer (8:29:21) for second and third. In the master’s division, Gnar Runners Team member Elijah Flenner (8:43:59) defended his title finishing an impressive fourth overall, while Vermont’s Alexandra Ambros (10:50:14) took home top honors for the master’s women – also registering an impressive fourth place overall. As always, we owe a huge debt of gratitude to our team of wonderful volunteers. Year after year we receive heaping compliments from our runners about how fantastic our volunteer team is, and they are absolutely right. Come rain (this year) or shine (last year), you guys are out there getting the job done and helping our runners get to the finish line safely. Thank You! In a cloud the whole day, the Towers team and all our volunteers rocked! And to our amazing sponsors, thank you! With generous product support from: VFuel, New Belgium, Mary’s Mountain Cookies, Great Harvest Bread Company, the Fort Collins Food Coop, Squirrels Nut Butter, and Boulder Organic! And A Great Day for the Gnar Team!!! We look forward to seeing you again in 2019 at the same place and approximately the same time. Or even better, we’d love to see you July 28 at the Never Summer 100km or at one of our shorter events. 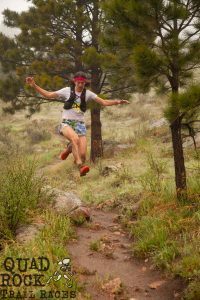 On September 8 we’ll be hosting the sixth running of the Black Squirrel Half Marathon in Lory State Park, followed October 20 by the 11th running of the Blue Sky Marathon, Fort Collins original and only Trail Marathon. If you aren’t racing, consider volunteering for one of our next events. We are currently recruiting volunteers for the Never Summer 100K. 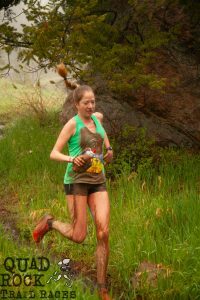 Do you have questions about trail running or want to learn more about the sport? 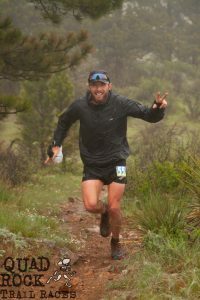 Join us for a fun night of trail running discussion on August 23rd at Altitude Running. 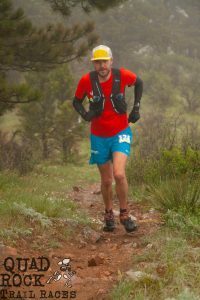 The evening will feature a Q&A discussion with a diverse panel of trail runners, beginning at 6:00pm. 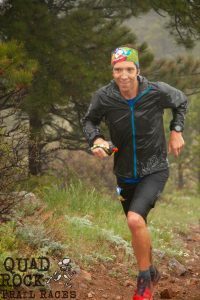 The panel Q&A will be mixed in with gear giveaways from Salomon Running, Drymax Socks and other race sponsors. We will also be featuring a Black Squirrel video course preview, with time afterwards for questions and discussion specific to the route and race strategy. During the evening, enjoy a beverage or two from our friends at New Belgium Brewing. 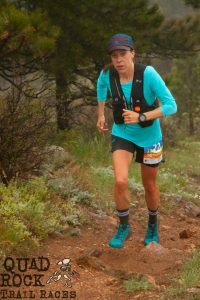 Cat Bradley shot to trail and ultrarunning stardom this June when she defied the odds in winning the famed and historic Western States Endurance Run. 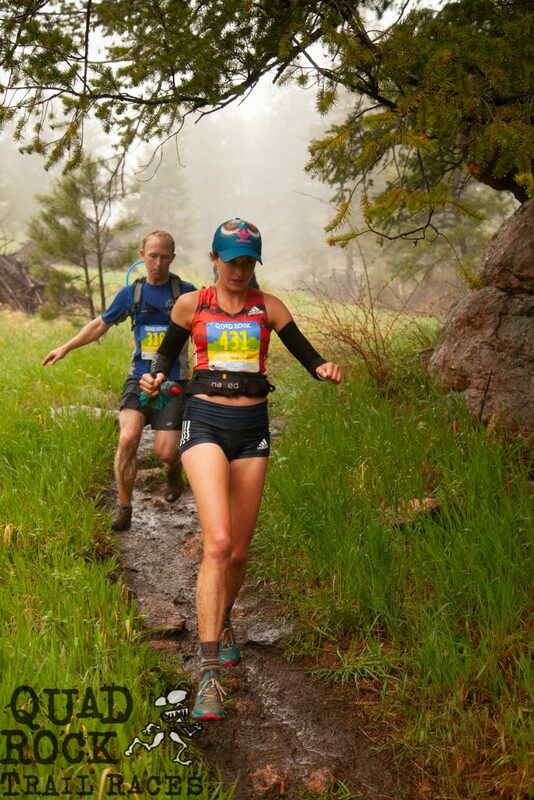 Hear her thoughts from that day and garner tips on how to improve your race performance. Lucas Mouttet owns and operates the Never Summer Outdoor School, teaching avalanche safety and wilderness first aid. 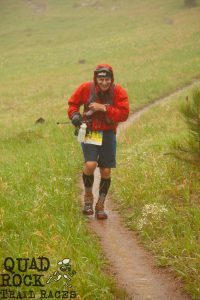 A trail runner, mountain biker and backcountry skier, Lucas is uniquely qualified to discuss any and all issues related to trail safety. 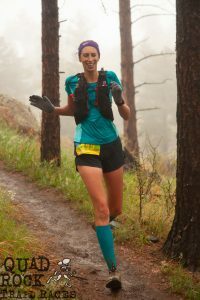 Sara Callor is the store manager at Altitude Running. 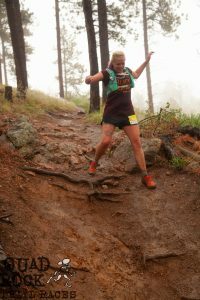 She ran the Pikes Peak Ascent as her first trail race some 10 years ago and returned to the trails last year to run the Black Squirrel Half. Come armed with gear questions. Sara has answers. 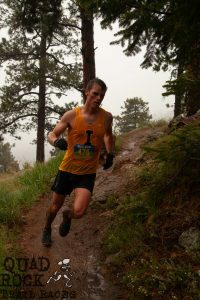 Stephen Pretak is the current men’s champion and only person to have run under 90 minutes on the Black Squirrel course. 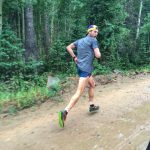 Despite these impressive accolades, Stephen is still relatively new to trail running and sometimes feels like he’s still trying to figure it out. You’ve got questions about transitioning to the trails, he’ll come up with answers.